This is just a quick post for those people who seem to end up here looking for info about yoghurt making. The best results I have had so far using the Lakeland electric yoghurt maker which I have been using for about eight weeks is from the following method. Quick to set up, no saucepans of cooling forgotten milk. 2 teaspoons of fresh live yoghurt – do not be tempted to use more, it will not make the yoghurt ‘happen’ faster or better! 2 dessertspoons of non fat skimmed dried milk, something I have never bought before but the yoghurt seems to like it, what more can I say? 1 litre of UHT milk. Ideally full fat. Morrissons 4 per cent fat performs better than Waitrose 3.6 per cent fat. Using UHT milk means you skip all that heating it up to a certain temperature and then waiting for it to cool down again, less washing up, so offsetting the carbon footprint of using an electric yoghurt maker, also if you make your own you are reducing your packaging use. Not sure if there is a net gain or loss but I am trying hard here. Put the 2 tsps of yoghurt in the bottom of the container. Sprinkle the non fat powder on top. Add a little UHT milk. Give it a good stir around. Put container in the electric heater bit. Add the rest of the milk. Put the lid on. And then leave for at least 8 hours, mine seems to take more like 9 hours to go. It’s odd stuff. You look at it and nothing happens for ages and then it goes all of a sudden. If you don’t have a yoghurt maker then use a wide necked flask or a jug, but you will have to consider how you will keep it warm. A good thermos flask will probably work fine. Yoghurt needs a warm temperature to develop. The lactobacteria and the Streptococcus thermophilus – the organisms that create the yoghurt – are called ‘thermophilic’ (lovers of heat) for that reason. It needs to be kept at 100-degrees Fahrenheit (37-degrees Celsius). It will get more sour the longer it is kept warm, so that is why you chill yoghurt in the fridge once it has developed to the thickness and taste you want. It is worth doing more research on the net if you want to know more about this. Take it out of the electric heater bit. Let it cool a while. I put mine in the fridge overnight and then put it into clean pyrex containers with snap on lids like these. You can use the easi yo stuff in it. I have found that it splits. But when it does split, it’s easy enough to strain it through a bit of muslin in a sieve and then you have wonderful whey for baking bread, can’t recommend this too highly, and a thick soft yoghurt that you can use in lots of ways. I can’t give you exact quantities because I basically shoved the lot in the blender and mixed and tasted till I got something I liked. 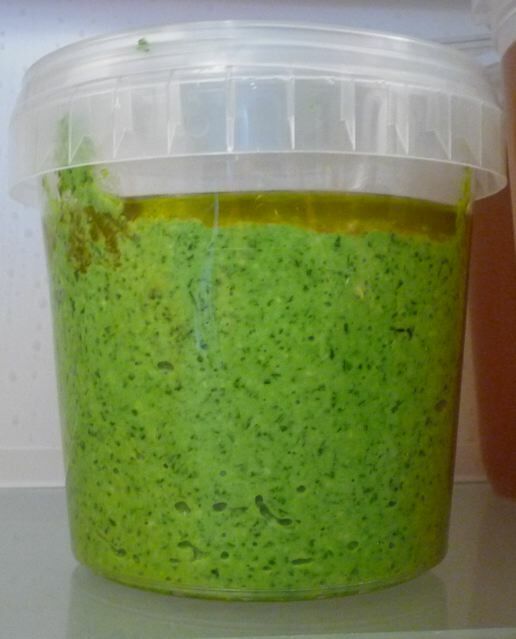 You can use any favourite herbs and nuts: this is my sister’s way of making pesto, as she prefers yoghurt to loads of oil, makes it much lighter. I store it in the fridge with a layer of olive oil on the top which reduces the effect of oxidisation. July 2010 – Made a lovely lime cheesecake with strained yoghurt (labneh) made from rich creamy Jersey/Guernsey milk. Click here to read the post and the recipe. This entry was posted in Recipes, Yoghurt and tagged homemade, lakeland electric yoghurt maker, rocket pesto, yoghurt on 18/06/2010 by Joanna. Jo, we make yoghurt using UHT milk as well. 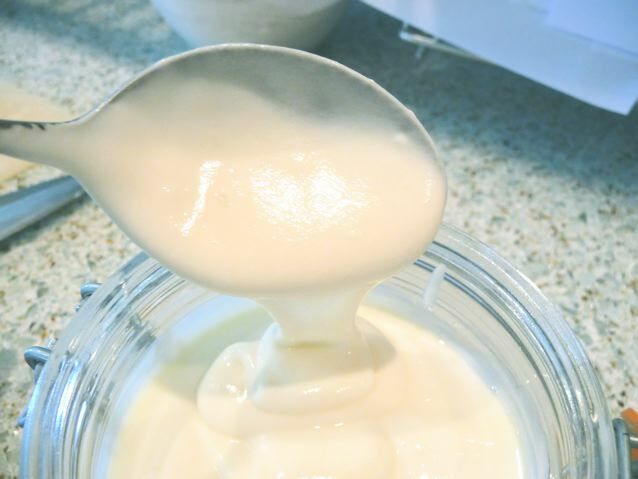 The nice thing about homemade yoghurt, which I know you know but thought I’d mention here for others, is that if it’s made correctly, most if not all of the lactose is converted to the stuff that’s good for you, so it’s a good option for the lactose-intolerant. This isn’t always true of commercial yoghurts, as milk powder is often added to those to thicken. Thanks Celia :) Do you think the milk powder that you add at the beginning gets converted then? Or do you mean that commercial yoghurts have the milk powder added afterwards? Jo, Pete thinks the milk powder he adds at the beginning gets converted too. I think the proof of that is the cream-based yoghurt you made recently. But often in commercial varieties, there is milk powder added after to thicken it. Interesting thing I’ve discovered recently – did you know milk powder is about 50% lactose? Whereas fresh milk is under 10%. Makes sense, of course, since fresh milk is mostly water, but relevant when you consider how often milk powder is added to processed foods these days! Celia, I am still not sure what the triggers are for the asthma re the dairy. I was reading on the ‘lacto free’ site yesterday and trying to figure out the difference between ‘intolerance’ and ‘allergy’. I am sure though that most people figure out what they can eat and not eat by trial and error. B can eat yoghurt, hard cheese, and even creme fraiche in moderation and yes it was interesting that the yoghurt made with cream didn’t trigger a reaction, where fresh cream does, but that’s him, it might not apply to someone else. It could be a protein that triggers the allergy rather than the lactose…. Unless he goes and does full tests we won’t know for sure. Hey, I don’t make pesto like that anymore! Now do it classic Italian style, no yogurt, just basil, salt, garlic, oil, pine nuts and pecorino or parmesan. But maybe I will revert to the yogurt version….. 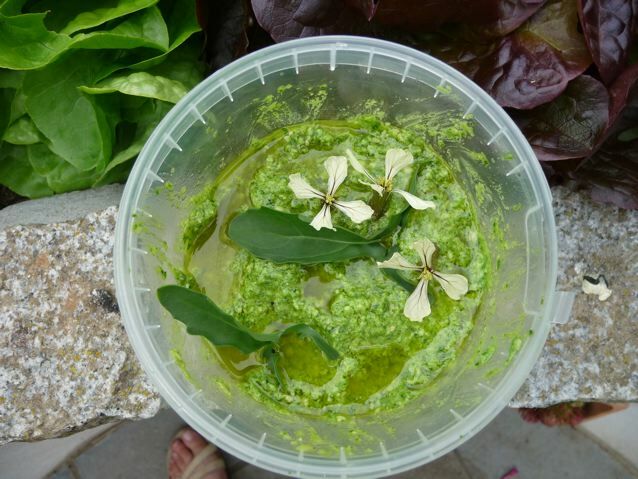 Loved the idea of yoghurt for pesto – I’m definitely trying it! Sally and Celia – It is, as the Tutak, says, not classical, but I like it, you can of course use basil, and I am pretty sure that Celia’s family aren’t keen on rocket anyway, but I have never managed to grow basil in such abundance that I can justify mashing it up into pesto. I was trying to use up what was in the cupboard, which happened to be cashews and walnut oil…..
Can’t get them to eat rocket, you know us too well, Jo. :) I make pesto out of anything I can find in the garden – sage, oregano, you name it. I’ve only ever made our yoghurt with full fat milk and culture. But I’ve heard you can add powder and use UHT – always been a fan of UHT after living in Spain – for ease. I’m told the texture result is better too. I usually have to strain my yoghurts for how we like it, thick and creamy. If you want to give this a try and do not have a yoghurt machine, do not be deterred. I don’t really have any space left in my totally overloaded kitchen cupboards for a yoghurt machine, so make mine in a wide necked vacuum flask…it holds 750 ml which is not ideal…1 Ltr would be better. Also like the bread it is addictive…very hard to go back to the bought stuff when you have eaten the real thing. I found some yoghurt makers here..nearly £60 each and add to that I would need to throw away something to make the space so for now the flask does the trick. Ooh, pesto with yogurt, how interesting. The pesto is such a great colour. I’ve got loads of rocket everywhere (it seems to have come up from last year’s compost) and have never actually made pesto from it. I shall give it a go and use yogurt. Thanks for the tip. We make kefir, which is a different type of fermented milk. This too is meant to convert the lactose. After years of trying to find a source of organic raw milk, we finally got lucky, so our kefir is hopefully even better for us. I have never tried kefir, is there a post about it in your archive? with lemon and more yoghurt to make a loose salad dressing, and then had some with a packet of crisps as a snack, very versatile stuff! I found a bag of organic milk powder on my travels today…so am going to try it in the yoghurt….how much would you use for about 750 ml of full milk ? I had a try with some yoghurt culture I bought in the supermarket…the first yoghurt with it was a bit thin, but the batch made from this first yoghurt (using the yoghurt 1 to start yoghurt 2) was the best ever….seems a bit like leaven that it needs a bit of “space” to grown on its own…don’ t we all !!!!!!!!!!!! It doesn’t like being disturbed either while it is culturing. And I find it takes longer than the suggested times, anything up to 10 hours. Pesto – freeze it. Saves you from that layer of oil business, when you have to keep adding more when you’re broken into the surface for a scoop or it all goes brown and manky. I found that even with careful oil layer, it tended to go furry in the fridge too quickly. I put it in ice cube trays, then when frozen decant the cubes into a plastic zip lock bag and keep in freezer….either let it defrost naturally or a ten second blast in the microwave then apply as normal. Works really well and keeps Shouty Boy nephew happy (I suspect I could get him to eat anything if it was covered in pesto). This works with both the classic and the yogurt version by the way…. …just thought of another variation I do when the price of pine nuts just seems too awful – pumpkin seeds.